The NES Classic Mini and its Japanese sibling the Famicom Mini both run Linux, and because of that Nintendo is duty-bound to share the source files for the hardware. 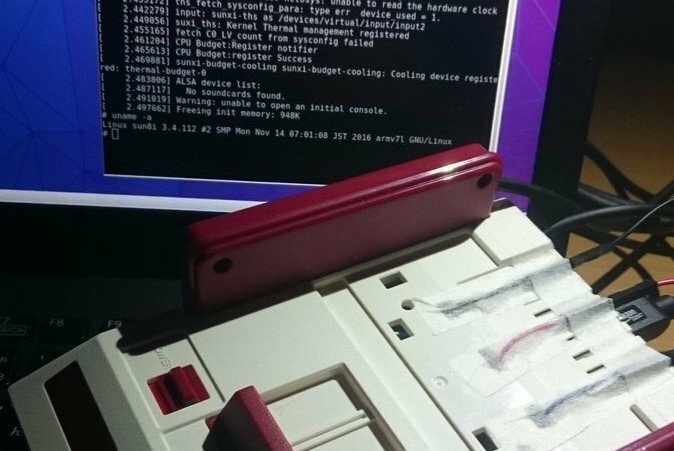 As you might imagine, this has led to industrious hackers - always on the lookout for something to crack wide open - discussing the ins and outs of picking apart Nintendo's latest piece of hardware, and one Japanese individual has actually done it. According to Ars Technica, the hacker used a serial-to-USB cable and powered the device using U-Boot loader software. The necessary files were then extracted, allowing him to attach to his own Linux kernel. While this proves the process works, the hacker doesn't seem to be focused on extracting the emulator or ROM files at present - in fact, his kernel doesn't actually do all that much. However, the door is now open and we'd expect others to follow his lead and hack the NES Mini - and Famicom Mini - so it can run other games and possibly even other emulators. Now if only people could actually buy one, right? Now onto the one that matters, the NES Classic Mini. Give it time, I'm sure someone's already on it. Not that I condone piracy. I don't. But it would be interesting to see how other NES games run on it. By the way, Famitsu are reporting that the Nintendo Classic Mini: Family Computer has sold 262,961 units in four days in Japan alone. It's sold out in Japan like everywhere else. I really wish it would be possible to expand the library in legal and official ways. It has to be feasable. But they won't do it. So, if I ever grew tired of these 30 games and the hacking becomes a straightforward method that doesn't jeopardize the unit, and assuming the emulation of the new ROMS is as good as in the official ones, why not? Although I don't know how would they introduce the save states and cover pictures of these new games. It isn't a necessary feature, but a welcome and cute one. Would be a lot easier to just buy a raspberry pi3. As a way to show that they can do it? Sure, it's kinda cool. But if this is what you want to do why not just get a raspberry pi or something. Gut a NES Mini for the case, drop a raspberry pi in it, get a USB -> CC adaptor. Done. Not the fact that he hacked it, but rather that he actually got one. ...will the NES/Famicom mini be featured in the hardware sales? Could be interesting. I don't know what this means but if it means someone could hack the system to hold say the top 100 NES games, without it really doing much else at all (so they don't ruin the simplicity, purity, and intuitiveness of the original NES Classic Edition concept with convoluted junk), then even that would be pretty awesome imo. I mean, the few things I would have changed about the NES Classic Edition/Mini if I had the chance would be to make the controller cable much longer and also detachable so people could choose to play either wired without lag or wireless depending on their preference, added the option to press say Start and Select together to go back to the main menu, included a power adapter in the box in the UK (although not essential if you can in fact run the thing by plugging the USB cable directly into the back of your TV anyway), and included maybe around 100 of the top games by default. @WilliamCalley Making it easy is not the point of such hacks... Making it happen/possible, that's what it's all about! @SLIGEACH_EIRE Yeah, it seems like this thing is going to sell in some pretty decent numbers overall. If they find a way to add more games, that would be great. LOL. Sarcasm of the day. It would be an inferior experience anyways, so thanks but no thanks. Adding additional games would have to be done in its own menu, probably only a text list, because it will more than likely not be able to fit them into the existing menu, with all the options and also the pictures and manuals, unless they also find a way to add those, but I don't think they will. @SanderEvers Please re-read what I said, you're sorely missing the point I made. I treat my original games just the way it is. No hacking, no cheating, no jailbreak, just be original. Will never get interested by illegal ways like that. @Mbrogz3000 we don't know yet. he's not using the USB port for this. You are right. The end user experience is generally not worth it. But crackers (it is a shame journalists never understood the difference between a cracker and a hacker and now it is probably too late to extract the poison) who reverse engineer software and modify it for fun do have their following. A system cracked is like a drug to some. It was for me back in the day. @Hotfusion True, and I was also interested in that, and to an extent, I still am, but only if it's a complete package (like a lot of emulators do offer), and adding stuff to a closed system with a menu front end and all that, will probably be more work than fun. If it can run a better NES emulator I might be interested in getting one. The homebrew should include a Sega Mega Drive emulator. Just for irony's sake. @nhSnork Not enough controller buttons, I'm afraid. @impurekind there is an issue regarding mappers. The included games rely on the most common and simple mappers. I get it, Lagrange Point and its unique mapper isn't high on anyone's list of tops, but some of the later, newer, prettier, games, may not run on the included emulator unless it is replaced by something else. (I guess the ultimate goal is whether FCEUMM or a defanged derivative can be used, since it supports most mappers known to man including Chinese-pirate-made-to-port-Genesis-games ones). People mentioning the Raspberry Pi are missing the point. Anyone can buy a Raspberry Pi and load illegally obtained ROMs on it. Not many can do anything in the video. @WilliamCalley Yep. Plus, any additional games loaded onto the box would simply be your standard emulation fare; no visual save points, no display mode options, no pretty/integrated menus, no user manual QR codes, etc. @Fandabidozi I won't name it here, but the site I've been using for NES ROMS for the last few years is still up and running fine. And I found a couple of complete ROMset downloads really easily a couple of months back. It's honestly not too difficult to find them at all at the moment. @Noelemahc What's to stop you from plugging in a Classic Controller? I'm just surprised the USB actually does anything. Whoops. @Fandabidozi Uhh, the main one most people use is still up and running just fine. As much as I held out on buying either of these because of the lack of games I wanted, I'm not really with this either because I have zero faith that the emulation quality would be anywhere close to the NES/Famicom Mini experience (which even as a non-adopter I acknowledge as a positive of the system). @BensonUii Do you know what sarcasm is? Yes I know what sarcasm is. I think @KiWiiU_freek's comment is considered one because I thought he's impressed because the guy hacked it. Only to follow it that he's impressed because the hacker managed to buy one. @Nookingtons How about a year after the Nintendo Switch comes out?